Tet holiday with too many banh chung, banh tet, spring rolls and other Hanoi traditional food makes many people feel sick with food. Along with Hanoi local food tours, discover immediately the places of eating at the beginning of the year in Hanoi to “dispel the bore” after the Lunar New Year, quickly return to balance with daily life. Crab vermicelli soup is a great choice for those who have been feeling the fear of meat dishes over the Tet holiday. Vermicelli soup is not only delicious, cheap but also frugal which will definitely ensure criterion to fight and prevent from boredom after Tet. Bun canh shop at 51 Hang Bo. Bun canh shop at 19 Nguyễn Siêu. Long, soft and yellow noodles blended with and fragrant sweet broth, and fragrant pieces of fun guo will make diners feel extremely comfortable and satisfied after days of boredom with banh chung and food on Tet holidays. Enjoying mi van than, you remember to squeeze a little more fragrant kumquat to make the noodles more attractive. 9A Dinh Liet, Hoan Kiem, Hanoi. Binh Tan Noodle shop at 54 Hang Chieu, Hoan Kiem, Hanoi. Many people tend to choose fish instead of meat to enjoy after Tet. Fish dishes, especially fish vermicelli soup, are both nutritious and delicious. Hai Phong Fish Noodle Soup at No. 92 Doi Can. Bun ca Thai Binh shop in Lane 21D Hang Bai. Bun oc is one of the delicious Hanoi street food that is particularly popular among young people. Wandering on the street, passing snails noodle soup shops at the beginning of the year, inhaling the aromatic flavors of the broth with coriander will help you escape away from the bad feeling due to banh chung, spring rolls and meat on Tet holiday. Therefore, the bowl of vermicelli which is cheap and delicious is the favourite choice of many young people after Tet. Bun oc shop of Miss Hue at 16 Dang Trung. Bun oc shop of Miss Them at No 6 Hang Chai. Bun oc shop of Miss Hue at 43 Nguyen Sieu. 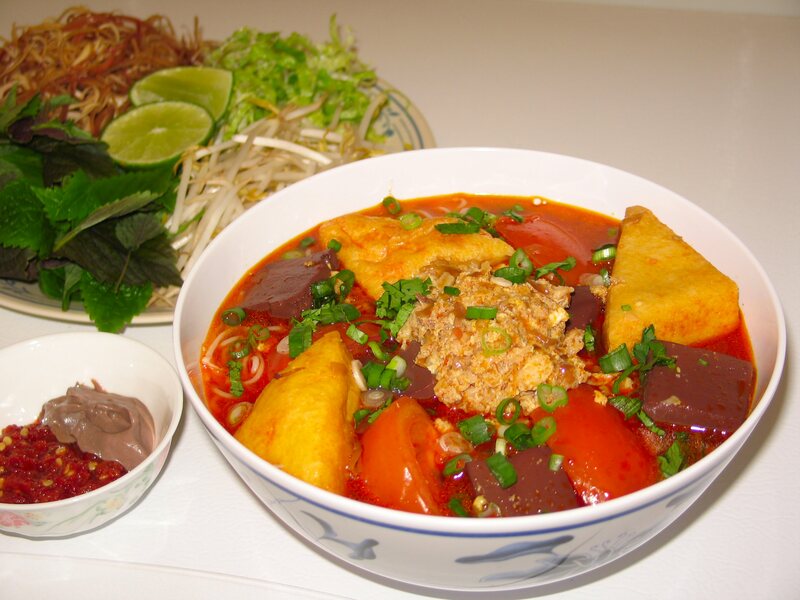 Bun rieu with soft noodle strands, soft flavory broth and cool pieces of fried tofu í one of the options that many people choose when they go out at the beginning of the year. Fragrant aroma of vegetables, fragrant and savory broth and pieces of cool and frugal fried tofu make the vermicelli dish become attractive for any customers every Tet Holidays. Moderately cut ​​noodle slices are used to roll raw vegetables and stir-fried beef, dipped with sweet and sour fish sauce with a few slices of raw papaya. This is a very light and delicious dish that you should enjoy after a long and busy Tet holiday. In Hanoi, the most famous noodle soup is in Ngu Xa, near West Lake. Not only chosen after Tet but even in the New Year days, the salad is also selected by many families to balance the nutrition in the tray of Tet food. Salads with full of vegetables, fruits and other attractive ingredients make you eat without boredom.